This evening I made a super quick and easy stir fried one-pot meal for dinner. 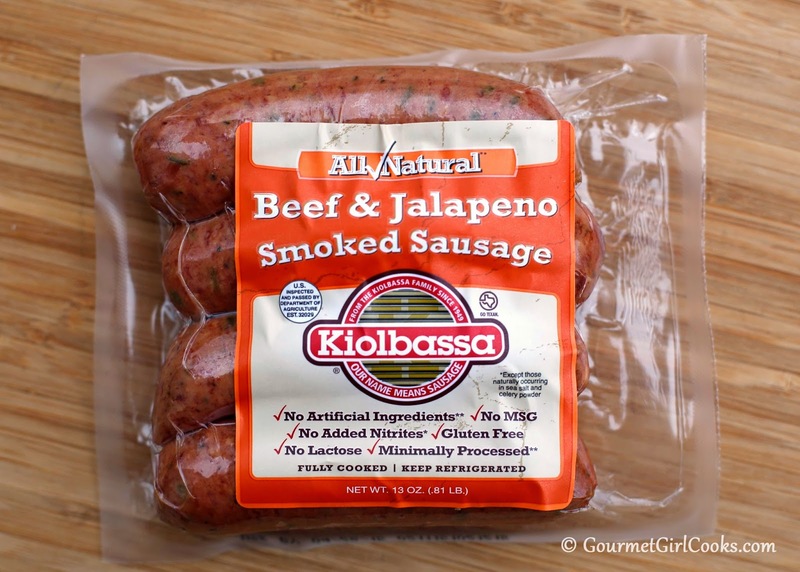 I picked up a couple packages of natural smoked beef sausages this weekend that I wanted to try. One was plain and the other was a spicier version with jalapenos. 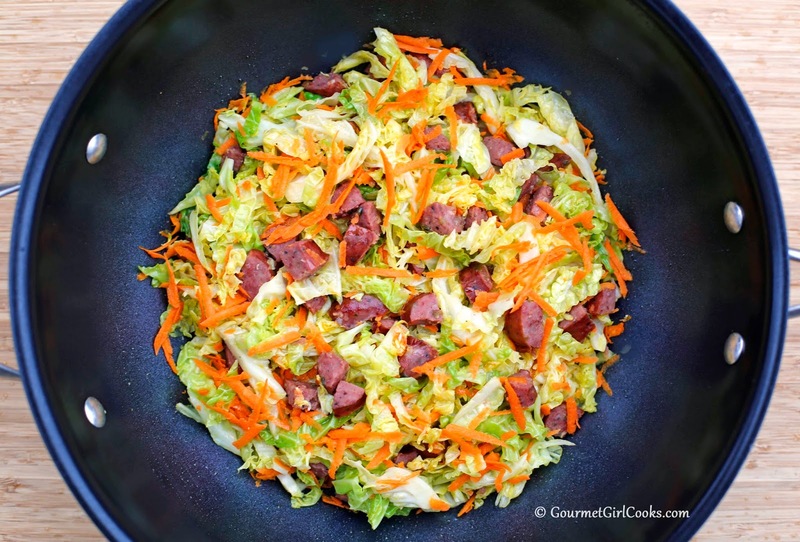 I decided to use the spicy version and make a hot "slaw" by briefly sauteing a few of the diced sausage links (I used 3 of them), thinly sliced savoy cabbage (a bit more tender than regular green cabbage), some grated carrot and a touch of apple cider vinegar in my wok. It was flavorful, quick and easy to make. 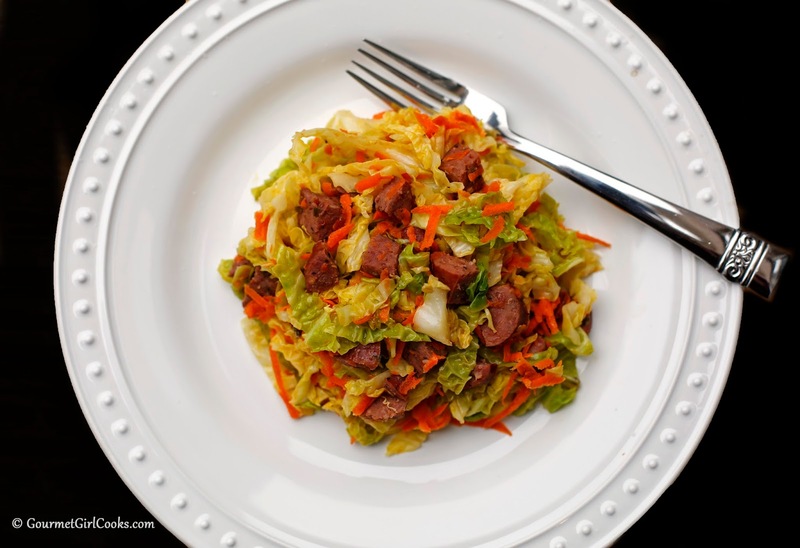 The sausage added both salty and spicy flavor; the tender-crisp cabbage provided some nice texture and chew; the grated carrot added a bit of natural sweetness, combined with the subtle hint of tartness the vinegar provided. I have enough leftover for lunch tomorrow, which is always a good thing! I snapped a few photos for you to see below and included the easy peasy recipe. You can easily substitute your favorite kind of sausage. Enjoy! In a large nonstick skillet or wok, saute diced sausage until browned; spooning out excess fat, if needed. 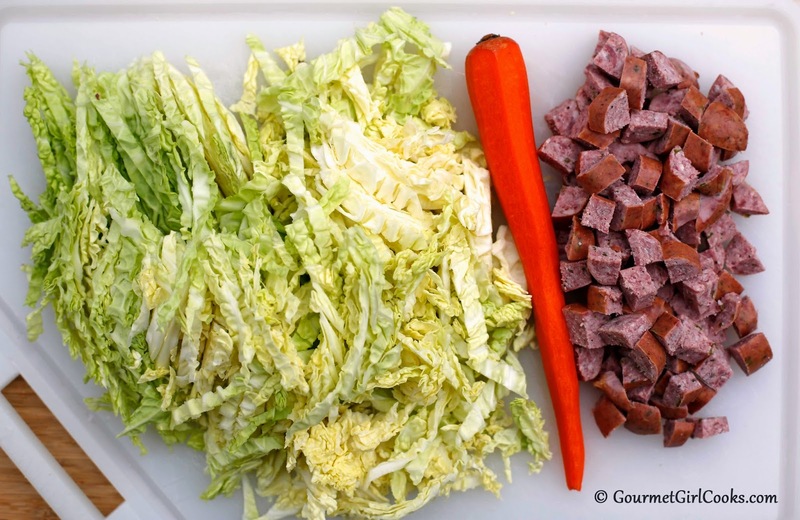 Add cabbage and saute, stirring frequently, until tender-crisp, about 5 to 7 minutes. Stir in grated carrot and vinegar. Taste for seasoning. *Note: The smoked beef sausage I used rendered plenty of fat when cooked so I did not need to add any oil for cooking (I spooned off about 1/4 cup as the sausage cooked and kept approximately 2 tablespoons in the pan). Regular green cabbage can be used in place of the savoy but may require a few extra minutes cooking to make tender-crisp.